This diminutive R/C boat is easy to build and transport, and racing one is more fun than dancing barefoot. While most classes of R/C boats would fit aboard a 33-footer, I also had to make sure I stayed in the good graces of my mother-in-law; no points are earned if you inadvertently start a fight between your in-laws! The boat would need to be securely stored onboard without taking over the whole cabin. Fortunately the perfect solution existed in the Footy Class. My plan was to develop and build a boat in time for Christmas. are not included inside the box, but the sails must be able move through the full range of motion while the boat sits in the box. The second rule states that the number of channels for the radio is limited to two. In essence, this limits the number of servos aboard the boat to two: one for the sails and one for the rudder. As a result of these rules, most boats are monohulls of between 12 inches and 14 inches in length (think diagonally). Due to the Footy’s small size, the cost to construct one is kept very reasonable. 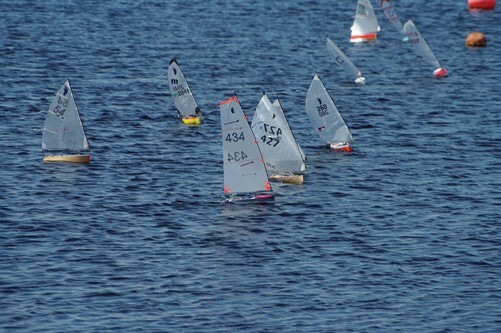 The most competitive boats are built out of balsa or molded plastic. While exotic materials like carbon are allowed, the weight benefits in this size range are non-existent. My idea for this Footy was to have a removable keel. With the keel removed, the boat could fit inside a cradle situated in some sort of carrying case to protect the boat while stored aboard the Cal in the quarter berth or lazarette, and to make transport to and from sailing easy. I found a plastic toolbox from a home improvement store that fit the bill. 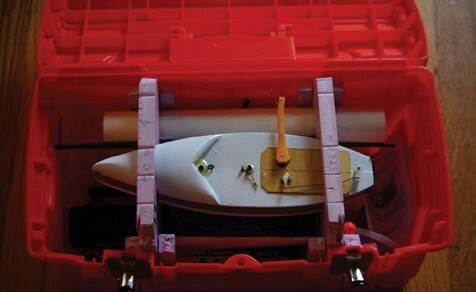 It easily contains all the parts of the boat and everything else needed to go for a sail, including the remote control. The package worked so well that I built another one for my father for his birthday, which was taken along for a six-week cruise to Maine this past summer. I have also built a few boats for myself, which I actively race. secretary for the U.S. Thankfully, the former class secretary, Bill Hagerup, is not leaving the Footy class and is staying on as a terrific resource. Bill is a prolific designer whose designs have won the AMYA Region 1 (New England) Footy Championship for the past several years. Bill has been kind enough to design the easy-to-build Footy (#434) pictured in this article. He and I have worked together to develop a package for a Footy for you to build and pack along, so the next time you are in your favorite harbor, be it Cuttyhunk, Mattiuck, or Tashmoo, you can bring out a Footy and sail. With any luck you’ll run into someone else sailing a Footy, or at the very least I am sure you will capture the interest of more than one fellow boater. 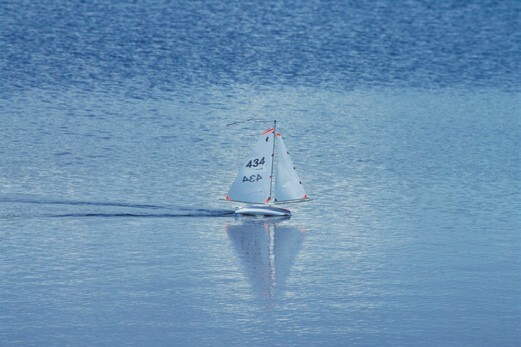 For more information including plans and build instructions, class rules, news, photos and more, visit footy.rcsailing.net.